Today’s play is a way to get the ball to a big at the basket. Vonn is the Associate Head Coach for the Women’s program at Syracuse. 1 dribbles to the wing. 3 curls around 4 and 2 cutting to the corner. 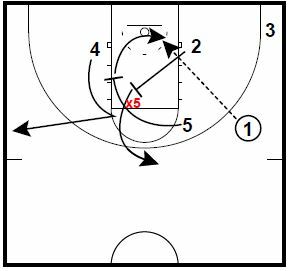 5 will turn and set the fake screen for 4. 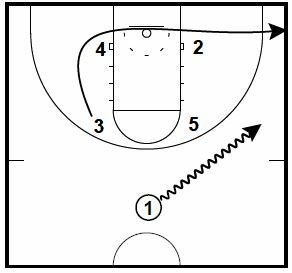 At the same time, 2 sets the screen for 5 for the slip layup. If X5 helps on the screen on 4, 5 should be open. If X2 helps, 2 should be open popping to the top.